Habit: Perennial herb, +- woody, evergreen, rhizomed. Leaf: cauline [basal], +- whorled, lanceolate to oblanceolate, leathery, generally prominently toothed, petioled. Inflorescence: terminal, +- head- or umbel-like raceme; flowers 1--10; peduncle generally papillate to glandular-hairy; bracts narrowly lanceolate to widely ovate. 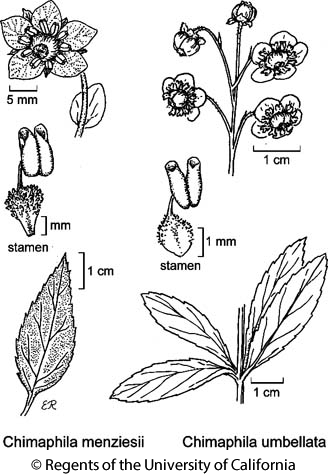 Flower: radial, nodding, parts in 5s, free; petals spreading; stamens 10, filaments widened at base, +- hairy, anther pores on tubes; nectary present; ovary superior, style in depression, stout, stigma wide, peltate, lobes 5, +- flat, spreading. Fruit: capsule, erect; valves opening tip to base, margins not fibrous. Chimaphila menziesii (D. Don) Spreng. Stem: < 15 cm, slender. Leaf: 1--several per node, generally 1--3(5) cm, toothed or entire; main veins +- white-bordered. Inflorescence: +- glabrous to minutely papillate. Flower: petals white, turning pink; filament base hairy. Citation for this treatment: Gary D. Wallace & Erich Haber 2012, Chimaphila menziesii, in Jepson Flora Project (eds.) Jepson eFlora, http://ucjeps.berkeley.edu/eflora/eflora_display.php?tid=19221, accessed on April 20, 2019. KR, NCoR, CaRH, n SNF, SNH, SCoRO, SnGb, SnBr, PR, MP; Markers link to CCH specimen records. Yellow markers indicate records that may provide evidence for eFlora range revision or may have georeferencing or identification issues. Purple markers indicate specimens collected from a garden, greenhouse, or other non-wild location.